When Ford announced that the sixth-generation Mustang will ditch the live rear axle in favor of an independent suspension, the drag racing community began to wonder whether there will be a new Cobra Jet race car. Fortunately, that was just a groundless fear, as FoMoCo just unveiled the 2016 Mustang Cobra Jet at the 2015 SEMA Show. Built around the sixth-generation Mustang, the new drag car is the first Cobra Jet since 2013. The previous race car was launched for the 2014 model year and once all 50 units were sold, Ford discontinued the model, most likely to focus on the Cobra Jet that debuted at Las Vegas this year. Also scheduled to be produced in 50 examples, the 2016 Mustang Cobra Jet will reach its customers in the first quarter of 2016 and hit the drag strips during the 2016 NHRA season. "The modern Cobra Jet has performed for our customers and put Ford in the winner’s circle consistently since 2008," said Dave Pericak, director of Ford Performance. "The new car is the first Cobra Jet built off the all-new 2015 Mustang – the only factory 2016 Mustang with a solid-axle rear suspension. We are excited to see it compete." Continue reading to learn more about the 2016 Ford Mustang Cobra Jet. Just like the previous dragster, the new Cobra Jet retains most of the production car’s design features. The front fascia is identical to the sixth-gen Mustang, with only the hood pins, the skinny front tires, and the missing foglamps setting it apart from its road-going sibling. The differences become a bit more visible around back, where the Cobra Jet received flared fenders and meaty Hoosier tires and a parachute. Cobra Jet received flared fenders and meaty Hoosier tires and a parachute. 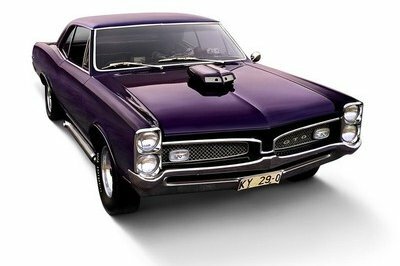 The muscle car can also be equipped with a wheelie bar, but the device doesn’t affect the design of the rear bumper. The "Cobra Jet" badges and decals are further proof that this is no regular sixth-generation Mustang. For 2016, the muscle car is available in only two colors: Oxford White or Deep Impact Blue. The Cobra Jet graphics package is offered as an option. Ford has yet to release photos of the Cobra Jet’s interior, but based on current NHRA regulations, it should retain most of the production car’s interior, including the dashboard, center console, and door panels. Naturally, the cockpit is also equipped with various racing features, such as an NHRA-approved roll cage, a pair of Corbeau FIA seats with five-point harnesses, a race-spec shifter, and additional dashboard gauges. Engine details are rather brief, but we do know that the 2016 Cobra Jet uses a modified version of the 5.0-liter "Coyote" V-8 found in the road-going Mustang and a Whipple supercharger. The mill mates to a race-prepped automatic transmission. Output figures are still a mystery, but if the previous Cobra Jet is any indication, the new dragster should come with at least 500 horsepower on tap. 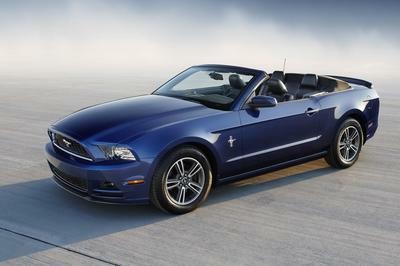 Ford does mention that the ’Stang is capable of eight-second quarter-mile times "as delivered." Believe it or not, the Cobra Jet uses technology from the Ford C-Max Hybrid. Specifically, the "Coyote" engine was fitted with the C-Max’s electric water pump that allows cool-down without the engine running. The result is more consistent results at the drag strip thanks to improved management of engine temperature. 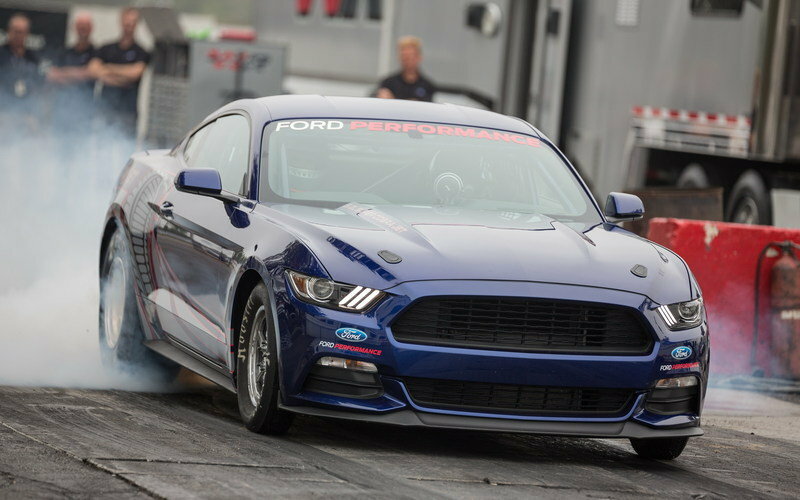 Ford said that intense dyno testing that simulates drag strip burnouts and quarter-mile runs was used to prove the system’s durability. The drag car received a solid rear axle developed by Ford Racing. The big news, however, lies in the suspension department. Despite concerns about the Cobra Jet’s future when FoMoCo announced that the sixth-gen Mustang will get an independent rear suspension, the drag car received a solid rear axle developed by Ford Racing. This makes the Cobra Jet the only factory 2016 Mustang with such a feature. Other race-specific components include coilover shocks and springs, lightweight brakes by Strange Engineering, and an Aeromotive fuel system with a trunk-mounted fuel cell. Like its predecessors, the 2016 Cobra Jet can be further modified for NHRA events with additional performance parts that can be found in the Ford Performance Parts catalog. Pricing for the 2016 Mustang Cobra Jet starts from $99,990, which is only $2,000 more than the 2014 version. The graphics package costs $1,995, while the wheelie bar adds another $1,995, taking the final price to $103,980. As usual production will be limited to only 50 units, 25 of which will be painted Oxford White and 25 finished in Deep Impact Blue. The race car is sold as a performance part without a VIN. Customers can order one by submitting a placeholder order for part number M-FR500-CJ through any North American Ford dealer. Production has commenced in November 2015 at the Flat Rock Assembly Plant in Michigan, with deliveries expected to begin in the first quarter of 2016. 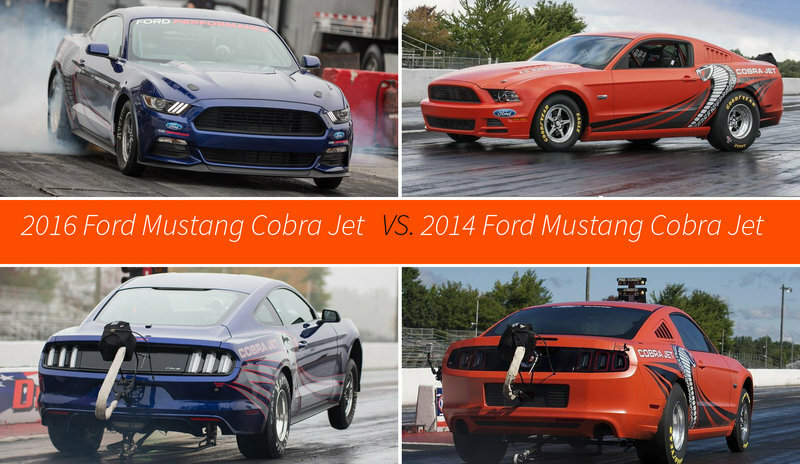 The 2016 Mustang Cobra Jet will hit the drag strips against brand-new race cars from both Dodge and Chevrolet. 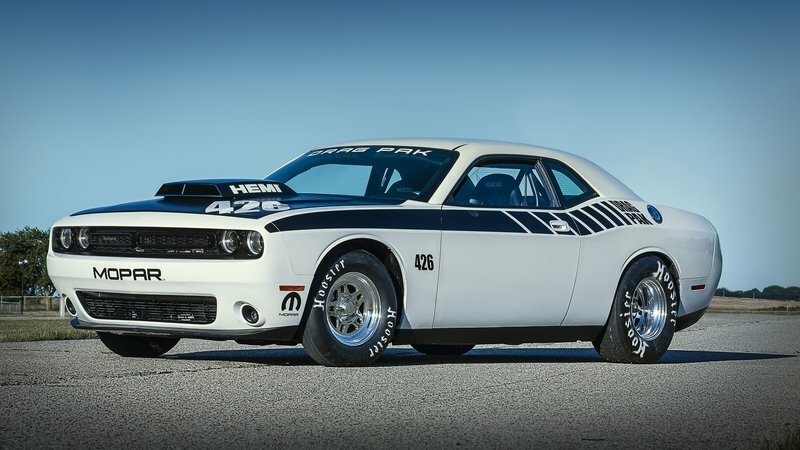 For 2016, Dodge introduced the Challenger Drag Pak, a Mopar-built dragster that can be had with one of two V-8 engines. The first option is a naturally aspirated, 7.0-liter, Hemi V-8 with an aluminum block, aluminum cylinder heads, and a custom performance engine calibration. 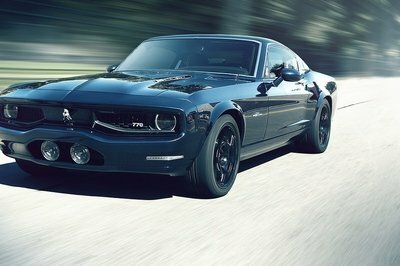 The second choice is a supercharged, 5.8-liter, Hemi V-8 with a 2.9-liter Whipple supercharger on top. 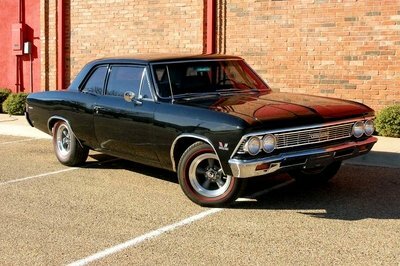 Both engines mate to a race-prepped automatic transmission upgraded from the previous-generation Drag Pak. Prices start from $99,426 for the naturally aspirated model and from $109,354 for the supercharged version. Find out more about the Dodge Challenger Drag Pak here. Arguably one of the most popular dragsters among enthusiasts, the COPO Camaro received a complete overhaul for 2016, being built around the brand-new sixth-generation Camaro. 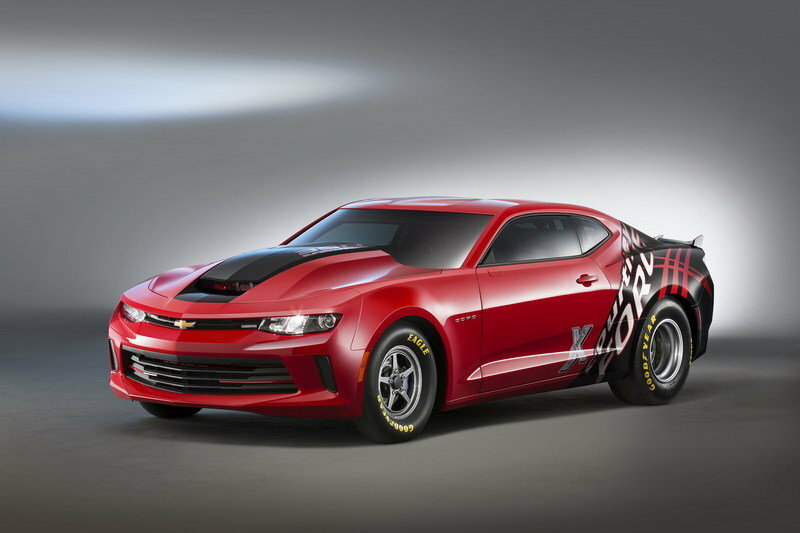 Lighter and more rigid than the previous model, the new COPO will be sold with a variety of supercharged and naturally aspirated LS- and LT-family V-8 engines built for the NHRA Stock and Super Stock classes. Choices include a supercharged 5.7-liter, a naturally aspirated 7.0-liter, and an all-new LT-based, 6.2-liter unit. All powerplants are backed by a race-prepped Turbo 400 three-speed automatic transmission. As usual production will be limited to only 69 units. Read more about the Chevrolet COPO Camaro here. 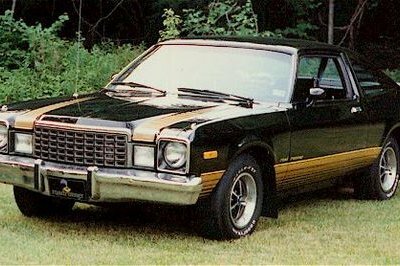 The last two years have been tough for both FoMoCo and Ford enthusiasts with no Cobra Jets on the market — leaving Chevrolet’s COPO Camaro as the dominant vehicle in NHRA’s Stock and Super Stock classes. Fortunately, this changes with the arrival of the sixth-gen-based Mustang Cobra Jet, which features many improvements over its predecessor. Though it’s too early to say whether the Cobra Jet has what it takes to outgun the new COPO Camaro and the Challenger Drag Pak, the 2016 drag racing season will definitely be a lot more exciting with three race cars to choose from. Ford Performance proudly unveiled the 2016 Cobra Jet Mustang today at the Specialty Equipment Market Association show in Las Vegas, marking the newest iteration of Cobra Jet as a limited-edition turnkey race car. 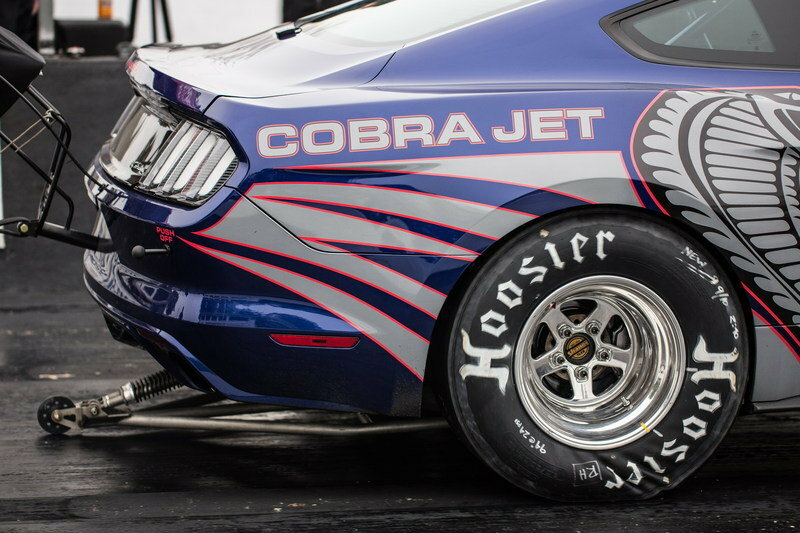 Like its predecessors, the new Cobra Jet is a factory-built race car that is legal for National Hot Rod Association Stock and Super Stock drag racing, as well as several classes in the International Hot Rod Association, National Mustang Racers Association and National Muscle Car Association. Also like its predecessors, the new Cobra Jet is limited to 50 units – making the 2016 edition among the most collectible Mustangs ever. Since its victorious debut at the 1968 NHRA Winternationals, Ford’s Cobra Jet Mustang has represented a legacy of power, performance and triumph. The modern program started with 50 cars for the 2008 model year, continuing with 50-unit limited builds in 2010, 2012, 2013 and 2014. For 2016, the car is available in Oxford White or Deep Impact Blue, with each color limited to 25 examples. 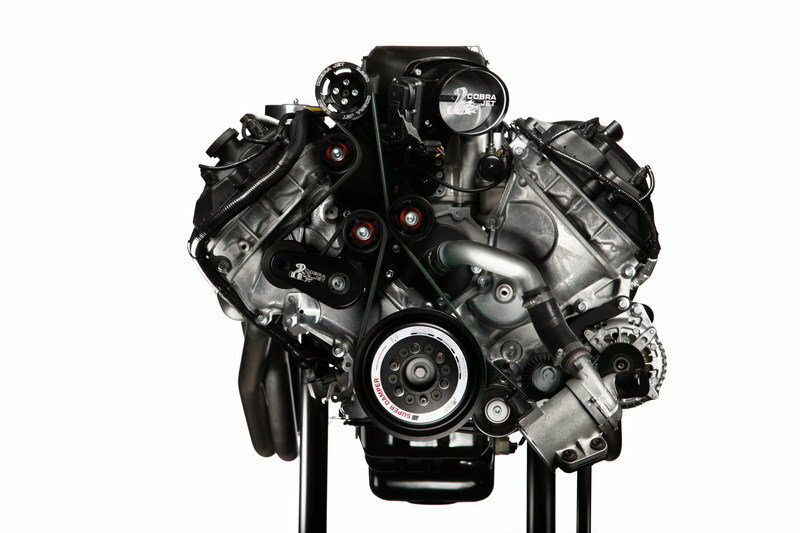 The Cobra Jet engine is made up of 75 percent production Mustang GT components topped by a front inlet Whipple supercharger; as delivered, it’s capable of eight-second quarter-mile times. For decades, Mustang has been the preeminent car in many forms of motorsport, including drag racing. Cobra Jet has added to that legacy – posting several high-profile wins including the 2015 NHRA U.S. Nationals Super Stock Eliminator and Factory Showdown races, while also holding multiple track records in various classes in the series. 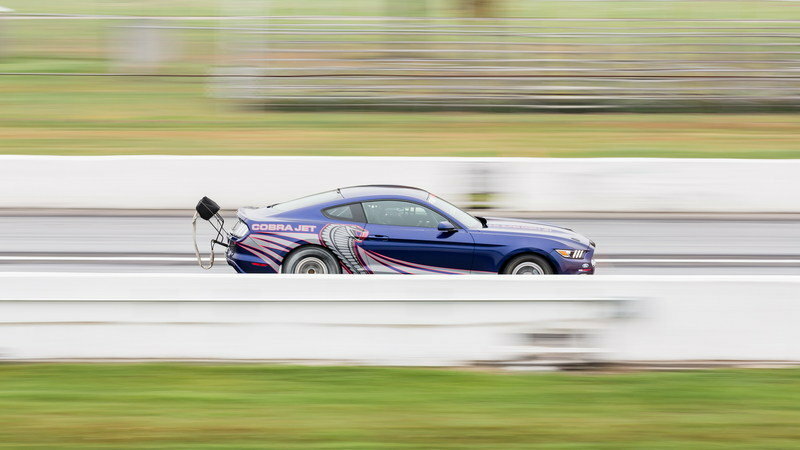 The 2016 Cobra Jet features such enhancements as drag race-specific coil-over shocks and springs, lightweight racing brakes by Strange Engineering, 8.50-certified roll cage, Aeromotive fuel system with trunk-mounted fuel cell, Corbeau FIA seats, five-point race harnesses and race-prepped automatic transmission. Ford Performance engineers tapped internal resources, taking technology from other parts of the company and adapting it for racing. The Cobra Jet engine uses an electric water pump from Ford C-MAX Hybrid that allows cool-down without the engine running – resulting in more consistent racing via improved management of engine temperature. 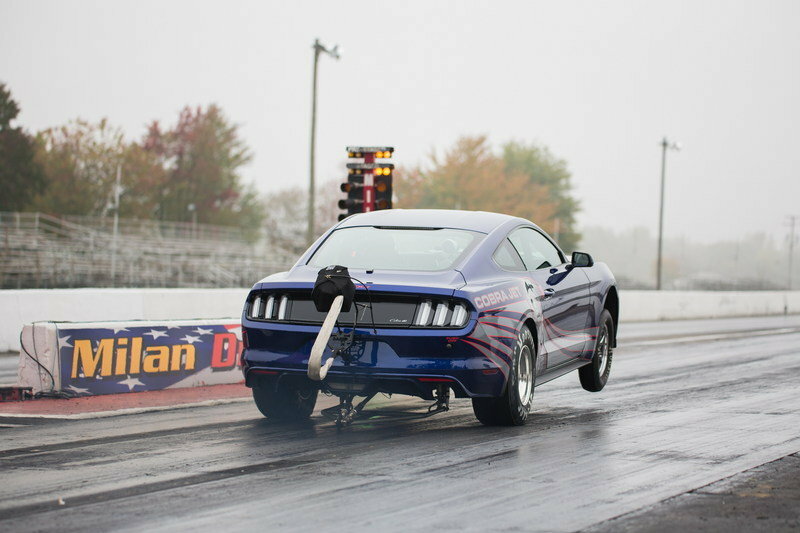 Dyno cells calibrated to simulate drag strip burnouts and quarter-mile runs were used to prove out engine durability. 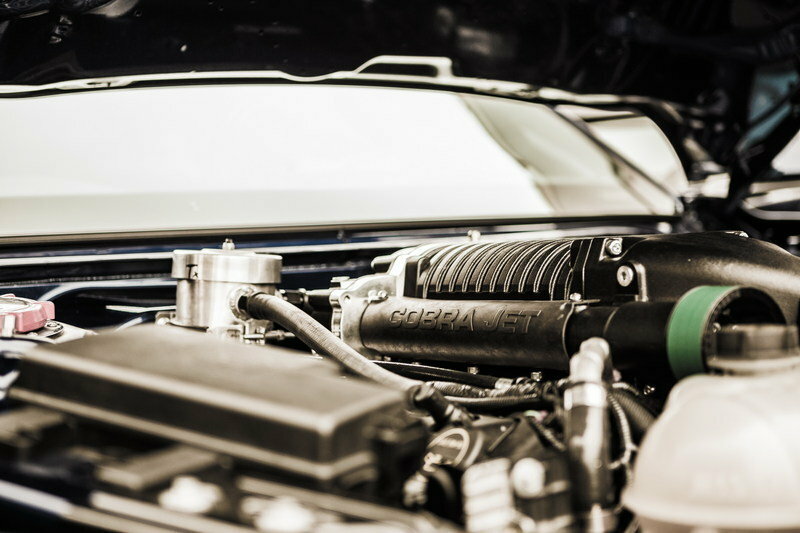 With the Cobra Jet engine’s highly proven components largely sourced directly from the Ford parts shelf, the car’s parts are durable, efficient and well-engineered. Additional performance parts can be found in the Ford Performance Parts catalog. Cobra Jet Mustang is getting its start at Flat Rock Assembly Plant in Michigan, with production now under way and delivery expected the first quarter of 2016. The 2016 Cobra Jet is sold as a performance part without a VIN. Customers can order one by submitting a placeholder order for part number M-FR500-CJ through any North American Ford dealer. MSRP for the base car is $99,990. The popular graphics option costs $1,995 and a wheelie bar costs $1,995.